The ledge above the panelling, when bordered with roses or almost any big flower, gives the effect of a lovely frieze; the ceiling is white, crossed with oak beams, from which are suspended silk-shaded electric lights. 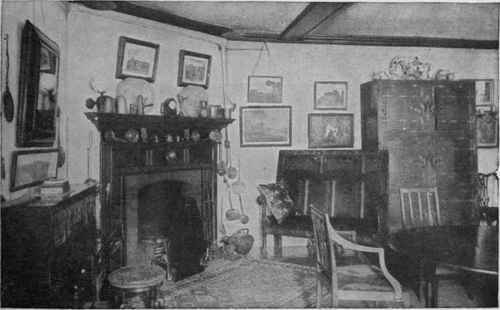 A great mirror framed in oak fills one end of the room; there is a dresser with old blue china and jugs, and more blue china on a shelf above the great open fireplace and on a shelf above the door. The furniture is old oak, with blue cushions in the carved armchairs; the floor is covered with very thick, coarsely woven matting, and Persian rugs everywhere. In a corner cupboard is old pewter; the window has leaded panes with a carved oak settle placed against it. I do not think one heirloom carries the virtue with it of sunshine, fresh air, simplicity of taste. If you cannot get the two first, you can furnish your dining-rooms with the latter, and given a table at which a man can sit in comfort with his surroundings - if there be a garden, or, better still, a landscape to look out at by day, then indeed his lordliest furnishing comes from without - an easy-chair in which he can rest and smoke the pipe of peace, cool walls, flowers that insensibly satisfy some colour-want in him of which he is ignorant, what does he care for luxury ? There should be a bookcase handy - a room without books is all wrong - but there should be no "pretty-pretties" in it; it should be a place to rest and eat in in comfort, with a couple of deep, comfortable armchairs at least. I confess to a great liking for a blue dining-room. Sheraton and Chippendale go extremely well with that colour, and I have in mind a room, the walls of which are papered with what looks like a striped blue silk with silk spots on it, and which wears extremely well. The carpet has a certain amount of blue in it, the art serge table-cover is a lovely shade of blue, an Indian wrought copper plaque candelabra hangs on either side of the Sheraton sideboard, the chairs are Chippendale, and the mantelpiece is most uncommon. It consists of two polished mahogany posts, that evidently helped to support one of the old carved four-posters, and these are fixed at a considerable distance from the vivid blue tiled fireplace; while above them is a mahogany shelf, the tops of the posters passing through holes made in the shelf, and below it a mahogany panel, with glass in the centre. Above are three blue and red jars, and the whole effect of the room is charming. Through the wide, leaded window unrolls a glorious view; and let me say here, that while, of course, in the country, lace curtains are an absurdity, even in town they can be done without. They are never clean more than a day, they obscure the look-out by their frowsiness, they harbour dirt, contaminate fresh air; in flats, where one is overlooked, they are still unpardonable, for strips of muslin-edged lace, that divide in the middle and give a free entry to air and sunshine, are quite adequate. Only when an alcove positively howls for a drapery should one be used, and then it must be substantial; all flummeries must be banished if any nobility of line is to be preserved. Of course, it happens sometimes that in the search for beauty a man loses his head and way, seeks the bizarre, the uncommon, or goes to extraordinary trouble and expense to collect furniture belonging to a certain Period, the result being chilly, unbeautiful, and, so far as the pleasure of the gazer is concerned, a complete failure. This collector is not necessarily the born seeker after beauty; he is usually a crank who concentrates on one aspect of the beautiful, and by so doing misses the great truth that it is in the proportion of one part to another that true harmony lies. He also misses the fact that if he appreciates rare curios and bric-a-brac, he has only to go and look at them in a museum, when he will see better far than any he is ever Jikely to be able to afford. And the most exquisite work of man cannot afford us the pleasure of the things made by God - it may be some enchantment of landscape, of sky or sea, or merely a flower, but it floods us with the knowledge that beauty is to be had for the taking, that ugliness in our lives, in our surroundings, is solely of our own making, and we can avoid it if we please. People who have a surfeit of luxury and show have very little knowledge of what beauty is. It is not a matter of furniture, and show, and lavish entertainment, which often accomplishes ugliness and revolts us by its sheer vulgarity, by its set determination to dazzle instead of charm. One could point easily to multi-millionaires of the present day who, with all the treasures of the world at their disposal, will hang one of Watts' prints beside an oil-painting in their dining-rooms, proudly display the most delicate water-colours on a voyante paper, scatter priceless Persian rugs about their floors without the slightest regard to their scheme of colour; so that you walk from one "object of virtue" to another, and wax profane over the shocking misuse of material that should have kept you dumb with ecstasy if isolated and properly arranged.